Thomas Dunne Books, 9781250052421, 240pp. Sally Baynard is one of the best lawyers around. In the years since her divorce from Family Court Judge Joe Baynard, she dedicated herself to representing the worst and craziest Charleston, S.C. had to offer. But none of the murderers, burglars, or angry divorcing clients compared to Sherman, the dog her ex-husband appointed her to represent. Although the miniature Schnauzer found his way into her heart (and brought his handsome vet Tony along too), his case was a thorny one. With that business out of the way, Sally is happy to move back to non-canine clients... until a probate judge asks her about a cat. Agreeing to represent Beatrice, a black cat who's the beneficiary of a multi-million dollar trust and a plantation, Sally must put her wit, charm, and brains to the test, choosing among three colorful potential caregivers while dodging the former owner's angry son. Meanwhile, Sally must juggle the demands of the court with those of her aging mother and make a decision about Tony, who wants to get more serious. 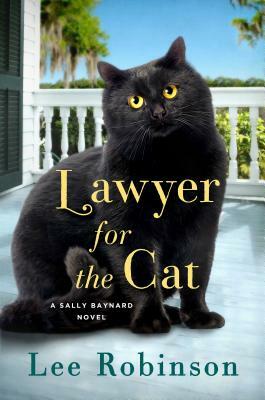 Lee Robinson's Lawyer for the Cat is Southern women's fiction at its most delightful, featuring strong, smart characters, a charming setting, and plenty of adorable critters. LEE ROBINSON is the author of Lawyer for the Dog. She practiced law for over 20 years in Charleston, S.C., where she served as executive director of a legal services agency and later worked in private practice, concentrating on family law. She was elected the first female president of the Charleston Bar Association and received the Bar Association's award for her work in public interest law. She lives on a small ranch in the Texas hill country.